Roll Back Massachusetts Sales Tax » Blog Archive » What is Your Unemployment Rate? Is it 1%, 10%, 20%, or 30%? What is Your Unemployment Rate? Is it 1%, 10%, 20%, or 30%? Based on Truman’s analysis, the most important unemployment statistic is our own; it is either 0% or 100%. Of course, that is not what is meant when unemployment statistics are quoted. Unemployment rates represent averages across the population and they are tracked and reported because they serve as a barometer of our nation’s economic well being. They also provide a simplistic scorecard for our government’s economic policies and our personal risk of being unemployed. Unemployment statistics, along with numerous other measures, are also computed and reported for individual states and municipalities. Our ears always perk up when unemployment statistics are quoted that are directly relevant to the locality where we work (or did work). Why? Because we are most concerned with how economic swings will affect us and our families. But if you are interested in gauging your unemployment risk, slicing and dicing national statistics to look at Massachusetts or the Merrimack Valley does not capture THE MOST IMPORTANT FACTOR in your risk. THE MOST IMPORTANT FACTOR, the factor that changes your risk from almost none to 30%, is rarely if ever discussed. Before revealing the secret key to your unemployment risk, let’s get a true measurement on the real national unemployment rate. When we read news stories about the economy, we are told that the national unemployment rate is hovering just below 10% (9.6% in the latest report). Often this statistic is qualified by explaining that it only reflects those actively seeking employment. That is because the standard unemployment rate figures do not include millions of discouraged individuals who would like to be employed, but have given up searching for a job. If these individuals were included in the rate, the unemployment percentage would be substantially greater than 9.6%. Also, the standard unemployment rate does not include other willing workers who may be working part time (8.6 million at latest count), or are otherwise “marginally attached” to the labor force because they cannot find full employment. A more accurate measure of unemployment is U-6, which includes discouraged workers and those marginally attached. If you were employed as an engineer or a bank manager, and you think working six hours a day at Burger King is an acceptable state of affairs, use U-3. If not, you should pay attention to U-6. The routinely quoted U-3 rate for the U.S. has grown from 4.6% in 2006 to 9.7% in the year ending in the first quarter of 2010 (the latest available annual figure). The more realistic U-6 unemployment rate has soared from 8.2% in 2006 to 16.7% for the year ending in the first quarter of 2010. 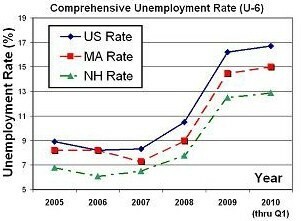 The above plot compares the U-6 unemployment rates for the U.S., Massachusetts and New Hampshire. As you can see, one in six workers in the U.S. is unemployed and one in seven in Massachusetts. Interestingly is that the latest unemployment rate in Massachusetts is one sixth higher than in New Hampshire (two percentage points above New Hampshire’s 12.5% rate). Could this be because our businesses must carry a 6.25% sales tax on top of a 5.3% income tax? Are you a government worker? The answer to that question is the real key to your unemployment risk. That is the KEY to the vulnerability of your family to the nation’s economic swings. Because most government jobs are union jobs and because the government disproportionately uses tax dollars to protect and grow both government employment and union jobs, government workers have the special privilege of being nearly immune to the nation’s economic fortunes. I have not found an official figure for the current number of government jobs, but adding up the Bureau of Labor Statistics figures for major categories of government workers indicates that the approximate number of government employees at all levels totals around 20 million. It is not clear whether employees of our intelligence community (CIA or NSA) or such pseudo-government entities as Freddie Mac or Fannie Mae are included in this approximate total. But it is not just government jobs (jobs that receive government paychecks directly) that are protected. Jobs that reside outside the government but which are directly and routinely supported by tax dollars are also nearly immune to economic fluctuations. When President Obama and Treasury Secretary Geithner say that the trillions of stimulus dollars being spent have “saved or created” millions of jobs, just what jobs do you think they are referring to? Not small business jobs, that’s for sure! So what does this all add up to? What is the impact on your unemployment risk? The answer lies in the totality of government spending as compared to Gross Domestic Product (GDP). 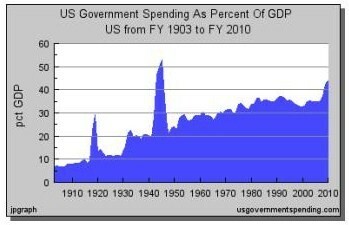 The above chart shows government spending as a percent of Gross Domestic Product from 1903 to the present time. The current percentage is nearly 45%, but is rapidly closing in on 50%. If you eliminate the surges in government spending during the world wars, the government is commandeering an extra 4/10 of one percent of the economy every year. Even Reagan wasn’t able slow the onslaught. If you use the current government percentage of the economy (45%) as a rough estimate of the percent of jobs that are protected and the remaining percentage of the jobs (55%) as representing those that are unprotected – in other words the jobs that absorb ALL of the swings in unemployment due to economic fluctuations – you can calculate the effective unemployment rates for each group. When you do this, you get a government unemployment rate near ZERO PERCENT and a private sector unemployment rate of (16.7%) divided by (0.55) = 30.4%. Let’s be generous and give a 1% unemployment rate to government jobs and 30% to real private sector jobs. So what is your unemployment risk? One percent OR over thirty percent? Are you flying high or going through a depression? Is it fair to forcibly (via government tax and spend policies) transfer nearly all of the risk of economic swings to half the population, while giving a taxpayer-funded safe harbor to the other half? We have a chance to fix this on November 2nd. Vote YES on 3 to roll back the Massachusetts sales tax to 3% – and create 27,000 new private-sector jobs. This is YOUR chance, and maybe your last chance, to change history and bring about some long-needed balance between the government sector and the private sector.